I thought I'd try my hand at a pair of boot cuffs. 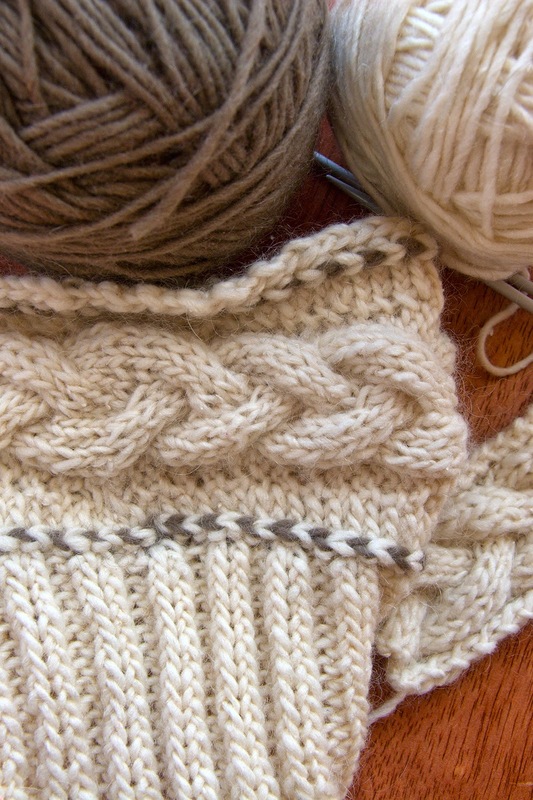 It's a great way to use up a bit of stash yarn, and an excellent chance to try out some new stitches without making a sweater-sized commitment. These are made with Harrisville Designs yarn, but to be honest, I'm not sure which one. I'm pretty sure it has just a little angora in it, and maybe some silk? This is the trouble with stash yarn, you see, especially yarn bought before I learned that I have to be organized about my stash. This particular yarn has been hanging around for more than a decade, and I'm absolutely sure that it is no longer available. Which is a crying shame, given that I've just fallen in love with it all over again. The pattern is my own, and combines a braided cable, grafting (which you can actually see in this picture), a yarn over braid, and some simple ribbing. It took me about seven hours to do the prototype, but I think it'll only take me about four to finish the other one.